In just one month, the percentage of Americans who viewed GOP vice-presidential nominee Sarah Palin unfavorably soared from 32 percent to 49 percent, according to a new survey. Might hostile media coverage account for Palin's skyrocketing unfavorable rating? Polls conducted in September and October by the Pew Research Center for the People & the Press report a stunning reversal in public perceptions of Palin. An October 21 story posted on Pew's Web site stated: 'In the current survey, 49% of voters express an unfavorable opinion of the Alaska governor, while 44% express a positive opinion; in mid-September, 54% viewed Palin favorably, compared with 32% who had an unfavorable opinion. According to a Nexis search, the networks ran 69 news segments covering Palin between September 29 and October 12, a period that included the October 2 vice-presidential debate. CMI analyzed all 69 segments and found that 37 portrayed Palin negatively, only two were positive, and 30 were neutral. ABC was the most biased of the three networks. Out of ABC's 15 segments about Palin, 9 (60 percent) portrayed a negative image of the Alaska governor, and 6 (40 percent) were neutral. NBC was the second-most biased network with 15 negative stories (54 percent) and 13 (46 percent) neutral. CBS was the least biased with 14 (54 percent) negative stories, 2 (8 percent) positive and 10 (38 percent) neutral. The positive portrayals appeared in the two halves of CBS Early Show anchor Harry Smith's two-part interview with Palin's parents. Not one of the evening network news shows ran a positive story about Palin. The overwhelming preponderance of negative stories might have been justified if all the news about Palin had been bad, but the two major news events affecting Palin coverage during the study window tilted both ways. At the beginning of the study period on September 29, Palin was still enduring network news attacks that replayed, over and over again, the most problematic moments from her September 24 interview with CBS News anchor Katie Couric. Four days into the study window, however, Palin turned in a solid performance in the highly publicized October 2 debate with Democratic vice-presidential nominee Joe Biden. 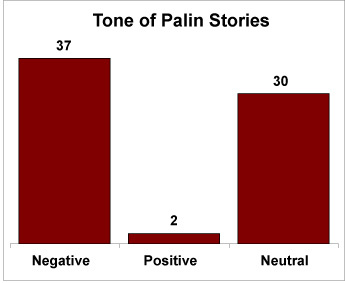 CMI found that during the study period, the media crafted three principal narratives about Palin. 1) Palin is a dunce lacking the qualifications and intellect to be Vice President. 2) Conservatives are revolting over the dunce's nomination. 3) Palin is a demon, little more than an attack dog victimizing Democratic presidential nominee Barack Obama. On NBC's September 30 Today show reporter Andrea Mitchell said, '…the McCain campaign is now so worried about Palin's ability to debate Joe Biden, she's gone home with the McCains for debate camp in Arizona.…' Mitchell repeated her theme that evening on NBC's Nightly News, saying, '… Sarah Palin, after reportedly not doing well in practices, retreating to McCain's Sedona compound to work with his top aides. After doing very few interviews and getting some poor reviews, like this answer on the bailout…' Mitchell went on to play an unflattering clip from the Couric interview. KATIE COURIC: What newspapers and magazines did you regularly read before you were tapped for this to stay informed and to understand the world? PALIN: I have a vast variety of sources where we get our news too. Alaska isn't a foreign country. The network coverage of this exchange left the impression that Palin was unable to identify any news sources because she isn't interested in current events - an implausible supposition to make about an accomplished politician. I do. A feminist who believes in equal rights. I believe that women, certainly today, have every opportunity that a man has to succeed and to try to do it all, anyway. And very, very, thankful that I've been brought up in a family where gender hasn't been an issue. You know, I've been expected to do everything growing up that the boys were doing. The NBC comedy show Saturday Night Live (SNL) doesn't make national news very often, so the obsessive network coverage of SNL ridiculing Palin may be unprecedented. During the study period, 8 network segments aired a total of 11 clips of actress Tina Fey's impersonations of Palin. Funny stuff, but is it news? James Poniewozik of TIME magazine pointed out in an October 9 article, 'The governor's comedian doppelgänger has essentially taken control of Public Sarah Palin: the composite of images, biography and attitudes that stands in for the actual person in voters' minds.' This couldn't have happened without the help of the news media. KATIE COURIC (CBS News): I'm just going to ask you one more time not to belabor the point, specific examples in his 26 years of pushing for more regulation. GOVERNOR SARAH PALIN (Republican Vice-Presidential Candidate): I'll try to find you some and I'll bring them to you. TINA FEY (Saturday Night Live): Well, in that case I'm just gonna have to get back to ya! 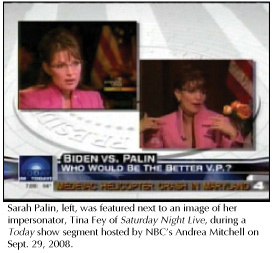 Based on criticism of Palin from a handful of conservative writers, the network news created the impression that conservatives and Republicans were rejecting the vice-presidential nominee. Network news programs ran a total of nine stories about conservative criticism of Palin. NBC's Andrea Mitchell stated in her report on Today, 'Palin's critics now include some conservative commentators,' before quoting Parker's column and cutting to a clip of New York Times columnist David Brooks criticizing Palin's performance in the Couric interviews. In a Nightly News report on October 1, Mitchell again noted, 'Even some conservative commentators say Palin is not ready for prime time.' Only NBC's Today made even a modest effort to balance the criticism, inviting former GOP presidential candidate Mitt Romney to respond to the barbs a few conservatives were tossing at Palin. With attacks on Palin's competence blunted by her debate performance, the media switched to a new approach: depicting Palin as nothing more than GOP presidential nominee John McCain's attack dog. 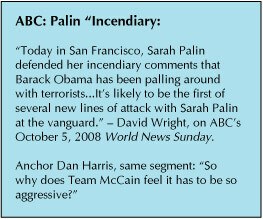 In the days following the debate, network coverage of Palin focused almost exclusively on criticizing her for criticizing Obama, with 14 separate stories repeating the 'attack' theme. Rather than investigate the substance of Palin's accusations against Obama, the media suggested the criticism was somehow improper. Over at NBC, Amy Robach said Palin 'accused' Biden of looking backwards at the Bush administration rather than looking forward. Biden, in contrast, merely 'challenged' the notion that McCain is a maverick. Absolutely. I think this is the Sarah Palin we're going to see out on the campaign trail for this next month. Aides say this is a role she's comfortable with. One told me she's a competitor. They also think she's particularly effective here. Look, everything Governor Palin does gets attention. They think when she issues a tough new line against Barack Obama, it rises above the din of other campaign news. So this is something we'll see from her. The campaign tells me they're ready to fight back. NBC's Mitchell stated during an October 7 Nightly News report, '[Palin's] jibes about Obama have increasingly provoked ugly crowd responses. Like today, when Sarah Palin exaggerated Obama's criticism of some civilian deaths in Afghanistan.' Mitchell illustrated her point by showing McCain-Palin supporters loudly booing Obama. As mayor and as a governor, I reminded people that government is not always the answer. In fact, government too often is the problem. So we got back to basics and we put government back on the side of the people. As mayor, I eliminated taxes on personal property and I eliminated taxes like small business inventory taxes. Those burdens on our small businesses, we got rid of them. Property taxes were too high. Every year that I was in office I reduced [taxes]. And as governor, I brought the same agenda of positive change on a state level. I came to office promising to control spending, by request if possible, but by veto if necessary. And today, our state budget is under control and we have a surplus. And I put the veto pen to nearly half a billion dollars in wasteful spending. We suspended our state fuel tax and I'm returning a chunk of our surplus money right back to the people of Alaska. It's their money and they can spend it better than government can spend it for them. Imagine that. Imagine that, having that principle. And that's what we're going to bring on a national level also. That principle of knowing that - no, the people, our families, our businesses they know best so let them keep more of what they earn and produce and not have this government take trying to quote, 'solve' all the problems for our families and our businesses. No, we're not going to do that. ABC, NBC and CBS are distorting the public perception of Sarah Palin by incessantly assassinating her character, even citing people they usually ignore, conservative columnists, because they have criticized Palin. The networks have actually stooped to mocking Palin by repeatedly rebroadcasting parodies from Saturday Night Live, as if frivolous entertainment belongs in the evening news. CMI can now add that the networks are portraying Obama's opponents - especially Sarah Palin - in the worst possible light.